It also gave us the opportunity to talk to attendees about how impoverished women are empowered through our beekeeping project in rural India, Project MNEP. On the day guests were educated on the importance of bees with informative and engaging talks from Friends of the Earth and Jenny Band from the Twickenham Beekeepers Association. Further entertainment was provided by live singing from the Wilful Choir and Sacha Heath who gave guests an introduction to the beautiful art of kirtan chanting and meditation. Guests also had the opportunity to buy local honey from the Wimbledon Beekeepers Association and pots of honey that were made from the working beehives in the Glass House garden… you really can’t get more local than that!! We were also delighted to welcome The Little Honey Bee Company to our event who were there selling their amazing beeswax and honey beauty products. We couldn’t have wished for better weather on the day – the sun shone all day and it was wonderful to see so many guests admiring the beautiful gardens at The Glass House whilst enjoying our selection of homemade Indian and honey-themed snacks and refreshments. 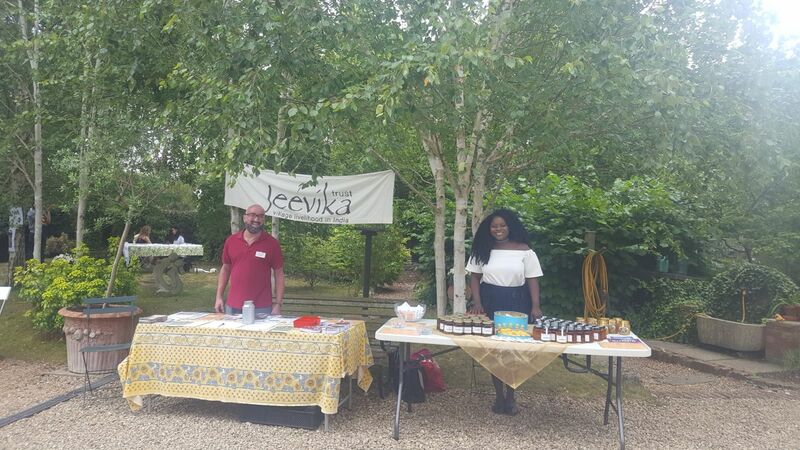 We were thrilled with the turnout on the day – a mixture of existing friends of Jeevika and new faces that we hope to get to know better – and we managed to raise over £900! Once costs have been taken out, this will go towards extending Project MNEP, our beekeeping initiative in Odisha. So we’d like to say a BIG THANK YOU to everyone involved with putting on this event and to all of you who came along on the day – we couldn’t do events like this without your support and it is much appreciated! If you would like to know more about our beekeeping project then please take a look at our Project MNEP page. Support our work with a small donation every month.